There's an all-new Hot Pursuit mode wherein you scorch the streets on either side of the law: elude the fuzz as a speeding motorist or enforce justice from a police patrol vehicle. 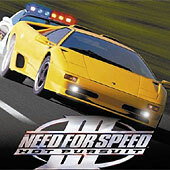 You also can download more cars and tracks from the Need for Speed III Web site. This game supports hardware acceleration, but you can play it software-rendered too. In the demo version, you race against another car (in Hot Pursuit mode). This page was last modified on 24 November 2010, at 13:39. This page has been accessed 150,506 times.